Computers used to be just for programmers, but these days most people own at least one. Now a similar revolution in access to drugs and other chemicals could be on the cards. A team of researchers led by chemist Lee Cronin at the University of Glasgow, UK, has made a selection of chemicals using a digital blueprint and a 3D printer costing $2000. The printer prints the lab equipment and then squirts the ingredients into the right places to make the desired chemicals. Though the most immediate application is to existing chemists by providing new ways to discover compounds, the technology could one day turn anyone with a 3D printer and an internet connection into a chemist. “It’s a way of democratising chemistry, bringing chemistry to the masses,” says Cronin. People in far-flung regions could make their own headache pills or detergent, he suggests. The technique might also allow people to print and share recipes for niche substances that chemical or pharmaceutical companies don’t make – because there aren’t enough customers, or they simply haven’t dreamed up those ideas. Of course, such freedoms will bring challenges too, including ensuring that drugs are made safely, and dealing with black markets that might offer prescription-only or illegal drugs. With the potential to allow anyone to build almost anything, 3D printing is no stranger to controversy – but how do you make chemistry printable? Cronin and his colleagues turned to a version of the $2000 3D printer used in the Fab@Home project, a collaboration aiming to bring self-fabrication into the home. They discovered that they could use a common bathroom sealant as the primary material for printing reaction chambers of all shapes and sizes, as well as connection tubes of varying lengths. After the kit had set hard, the printer’s nozzles squirted in the reactants, or “chemical inks” (see diagram). In principle, the dimensions of the equipment and chemical ingredients required to produce a particular product can all be pre-designed and embedded in the same software blueprint – all a user needs to do is download it and feed it to the printer. The researchers envisage an online store where you download an app for a particular drug to your 3D printer and order a standard set of chemical inks. That’s a way off, though. So far, Cronin has printed a simple block containing two chambers connected to a central mixing compartment. That was enough to carry out simple inorganic and organic reactions, and produce totally new compounds. This was done as a proof of principle – the resulting compounds don’t have specific applications. The researchers also carried out a well-known reaction requiring a catalyst. They printed the catalyst into one of the chamber walls and produced the expected product, showing that this method works. Cronin emphasises that the team’s method fundamentally changes the way chemistry is done. No longer are test tubes, flasks and beakers passive players, they have become active agents. That’s because a chemical reaction depends not just on the starting ingredients, but also their ratios and the speed at which they are mixed. This can be altered by changing the size of the reaction chambers and the distances the inks have to travel to reach them. “If your reaction doesn’t work, rather than just changing the reagents you change the shape of the reactor,” he says. This geometric control allows the intricate details of a reaction to be varied systematically in new ways, which might result in totally new compounds. Cronin showed that this was possible by repeating one of the reactions. He used the same amounts of starting materials, but programmed the printer to reduce the size of the central mixing compartment. Only the reactants that trickled in before the compartment filled up got to take part in the reaction. This was enough to change the products of the reaction. Printed labware might also vastly speed up the discovery of proteins. Flasks could be printed with small protein chains and amino acids washed through to see what reacts. Unlike existing methods for protein discovery, this could be combined with biological structures such as blood vessels and even some organs, versions of which can already be printed, offering a way to quickly screen the effects of new proteins. In future, Cronin plans to expand the menu of labware that can be printed. To provide a heat source, equivalent to a Bunsen burner or hotplate, he suggests printing metallic elements into the flasks at certain spots, which would heat up when placed in a microwave oven. It should also be possible to print a window into the reaction vessel. That way, the camera on your smartphone and an app could examine the mixture to tell you how a reaction is progressing. There are bound to be some limits, though. Cronin admits he’s had to deal with a few fires in trying to print reactions that can be explosive in the presence of oxygen. He hopes that by changing the flask material from bathroom sealant to something like Teflon, such air-sensitive reactions will become easier. The team is currently working on a kit to print ibuprofen. “In countries where there is little access to even the most basic drugs and cleaning products, still most people have access to mobile phones,” Cronin says. It’s not clear how such people will get a 3D printer and the chemical ingredients. 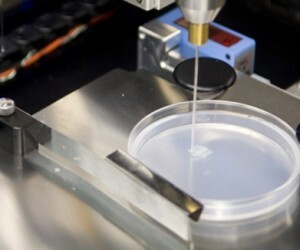 However, there are projects to distribute 3D printers in the developing world to enable things like bicycle parts to be made, and Cronin points out that most drugs and detergents are made of carbon, hydrogen and oxygen, also the components of readily available substances such as corn syrup, glycerol and paraffin. There is also the possibility that non-chemists in the developed world will use the technology to buy and share recipes directly from chemists – perhaps for substances that a company hasn’t thought up or commercialised.